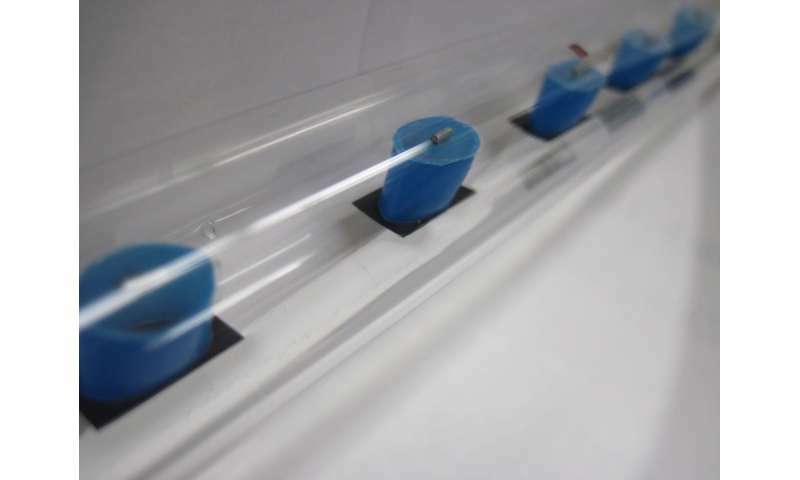 Scientists at the Department of Energy's Lawrence Berkeley National Laboratory (Berkeley Lab) demonstrated how particles, floating on top of a glycerin-water solution, synchronize in response to acoustic waves blasted from a computer speaker. The study, published today in the journal Nature Materials, could help address fundamental questions about energy dissipation and how it allows living and nonliving systems to adapt to their environment when they are out of thermodynamic equilibrium. "Dynamic self-assembly under non-equilibrium is not only important in physics, but also in our living world," said Xiang Zhang, corresponding author of the paper and a senior faculty scientist at Berkeley Lab's Materials Sciences Division with a joint appointment at UC Berkeley. "However, the underlying principles governing this are only partially understood. This work provides a simple yet elegant platform to study and understand such phenomena." To hear some physicists describe it, this state of non-equilibrium, characterized by the ability to constantly change and evolve, is the essence of life. It applies to biological systems, from cells to ecosystems, as well as to certain nonbiological systems, such as weather or climate patterns. Studying non-equilibrium systems gets theorists a bit closer to understanding how life—particularly intelligent life—emerges. However, it is complicated and hard to study because non-equilibrium systems are open systems, Zhang said. He noted that physicists like to study things that are stable and in closed systems. "We show that individually 'dumb' particles can self-organize far from equilibrium by dissipating energy and emerge with a collective trait that is dynamically adaptive to and reflective of their environment," said study co-lead author Chad Ropp, a postdoctoral researcher in Zhang's group. 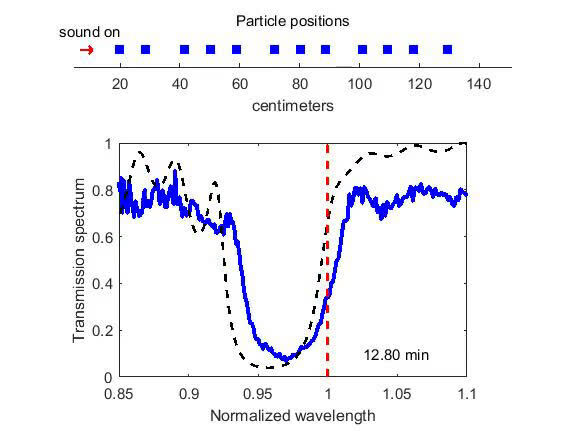 "In this case, the particles followed the 'beat' of a sound wave generated from a computer speaker." "The distinction in our work is that we can predict what happens - how the particles will behave - which is unexpected," said another co-lead author Nicolas Bachelard, who is also a postdoctoral researcher in Zhang's group. As the sound waves traveled at a frequency of 4 kilohertz, the scattering particles moved along at about 1 centimeter per minute. Within 10 minutes, the collective pattern of the particles emerged, where the distance between the particles was surprisingly non-uniform. The researchers found that the self-assembled particles exhibited a phononic bandgap - a frequency range in which acoustic waves cannot pass - whose edge was inextricably linked, or "enslaved," to the 4 kHz input. "This is a characteristic that was not present with the individual particles," said Bachelard. "It only appeared when the particles collectively organized, which is why we call this an emergent property of our structure under non-equilibrium conditions." "This is something you could do yourself in your garage," said Ropp. "It was a dirt-cheap experiment with parts that are available at your corner hardware store. At one point, we needed bigger straws, so I went out and bought some boba tea. 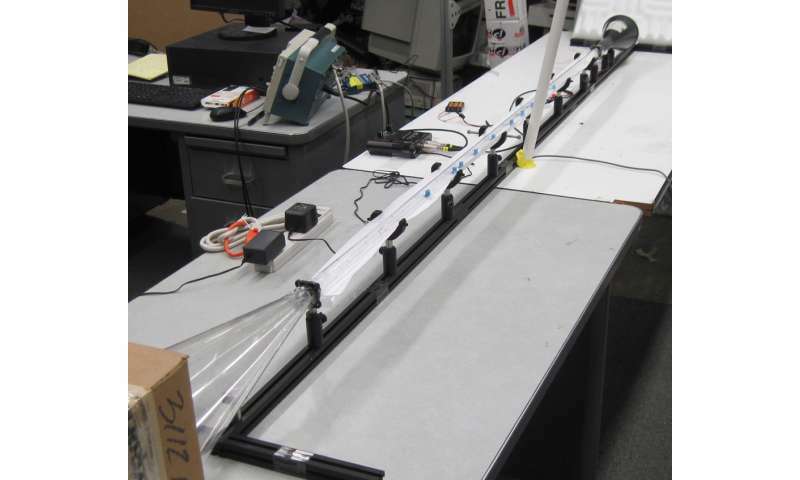 The setup was extremely simple, but it showed the physics beautifully." "I can think of parallels to artificial brains, with sections that respond to different frequency 'brain waves' that are malleable and reconfigurable," said Ropp.